“The leaves fall, the wind blows, and the farm country slowly changes from the summer cottons into its winter wools.” — Henry Beston. Fall is upon us and it’s finally time to wear those heavy knits and corduroy pants I picked up the summer. This weekend, Adam and I found a tour at Old Fort Erie called All Hallow’s Eve tour. Having both us never been to this fort before, we just had to go. We left our house around 4:15pm so we could drive down to Fort Erie then up the Niagara Parkway. 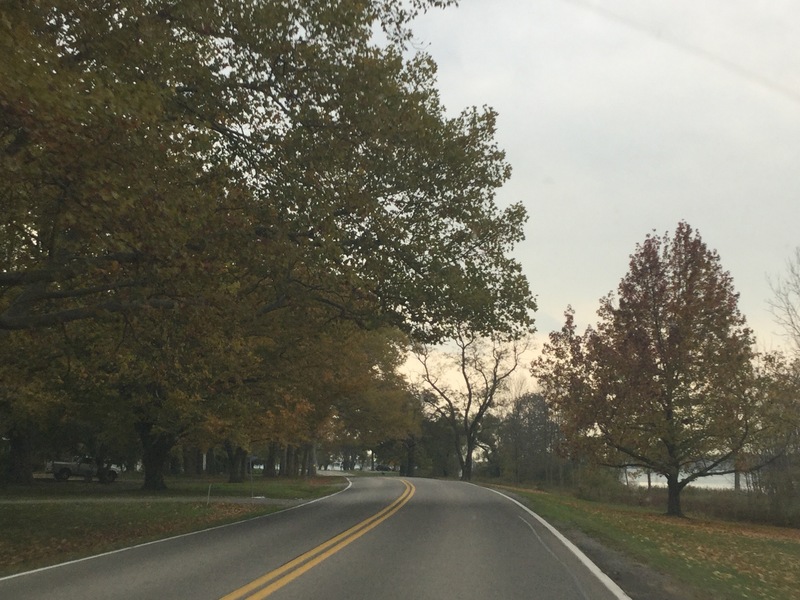 This long road runs north/south along the Niagara River from Niagara-on-the-Lake to Fort Erie about 55km. You can see the New York State (Buffalo, Grand Island, Youngstown to name a few) on the drive and it’s gorgeous; I think we are not privileged enough to have the better view across the river ;). We drove down so early just to see the leaves and the river. The houses that line the road range from old 50’s style country houses to the ostentatious modern houses (you can tell which ones I loved). My goal next summer is to get a hitch for my car and bring my bike to the parkway and ride from NOTL to Fort Erie. I might need to call an ambulance to take me back to my car though :s.
Love this house ahead. They’d let me move in…right? After that 1 hour ride out of the way, we stopped at Smoke’s Poutinerie. Adam found this place from a guy he works with (our first born will be named after him now). It’s a great concept for the adventurous Canadian. We’ve been before and I got the traditional (fries, gravy, and cheese curds- excuse me while I drool) but this time I thought I would be more daring. I got the Chili Cheese Poutine; homemade Chili, cheese sauce, bacon, cheese curds, gravy, and fries. 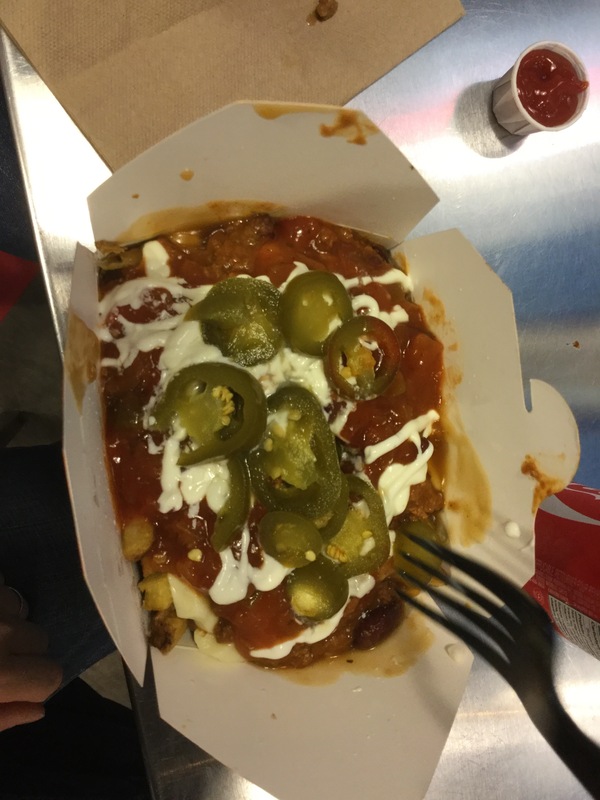 Yes I know it’s a heart attack waiting to happen, in the words of Gloria from Modern Family “It was deleeecious!” For two people (two regular sized poutines and two cans of pop) it came out to around $21; not bad to fill you up. I did have to add my touch and put elegant ketchup and vinegar on top. Yes, I know I’m weird. Adam had pretty much the same as me on his Nacho Grande but he had jalapeños and salsa on his. He couldn’t wait for me to take a picture before he started stuffing his face (see fork). After that, and waiting a bit for the food, we only had about half hour to stop in and see my Mum. Now the thing with my Mum and Adam is they like to try and outdo each other with pranks. Many a time I have been woken up by my Mum calling me saying Adam turned the heating up in her apartment and she woke up in a pool of sweat. Now I’m not talking about a few degrees; I’m talking about the full heat (30°C). So when we got there, she had already turned it up full blast as to not go swimming in the night. Needless to say Adam was a little disappointed and I’m pretty sure I say some side glances from adam looking around the room as what to tinker with next. Well I didn’t get a frantic phone call this morning, so I think Adam stayed on his best behaviour for once. Our tour started at 8pm so we were rushed for time with my Mum, but luckily, Old Fort Erie is about 20 minutes away from her house. As usual, we got lost and drove right passed the Fort. We finally pulled up and ran to the building around 7:58pm. As we see waiting in line to sign in, one of the tour guides was calling out for the 7:45pm tour. “Huh?” we thought. We looked again at the time thinking we were early (me thinking Adam had turned our watches ahead instead of my Mum’s- yes this has happened too). But it turns out they were running late too. We got on the 7:45pm tour as there were only around 15 people. We sat in a makeshift theatre and waited for the tour guide. Finally, at 8:08pm the tour started. We walked outside towards the Fort gates. We had Mike for our tour guide and was funny. He warned us that if there were any stragglers, that they would be kidnapped and be forced to work for Old Fort Erie; Mike was kidnapped 7 years ago and has worked there ever since-we will try to free him next time. The tour lasted around 15 minutes going into the buildings and grounds and explained the origins of Halloween. Halloween being a night where locals of the village would dress up with masks and costumes and knock on neighbours door for food. The trick-or-treat part came where if the neighbour couldn’t guess the identity of the villager, then they would have to provide them food (I barely know my next door neighbours let alone people in my town). We were then take up to the officers quarters where we saw this one room. It belonged to an officer during the War of 1812, where actually lived. 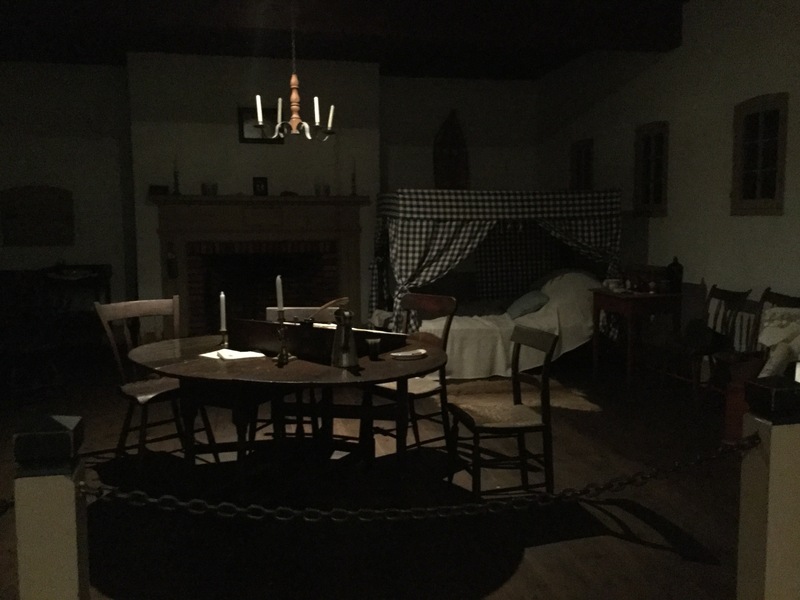 Now all the artifacts in the room are rea antiques, the only one that was there during the War of 1812 was the four poster bed. It stayed in the mans family until it was given to the Fort by his family in the mid 20th century. He had died in this bed at Burlington Heights in Hamilton in 1813. They said that ever since they have received this bed they have had a lot more ghost sightings in that area. The tour was only in two rooms, then after there was a burning of the Guy. Back in 1605 in England, he and other men conspired to blow up parliament with King James inside with gunpowder. This was to assassinate the King and restore a Catholic monarch to the throne. He was captured before the plot could be completed (on November 5th) and was sent to be hung, drawn, and quartered. But before they had pulled the support from underneath him during the hanging, he jumped to his death, breaking his neck and instantly killing him; giving no satisfaction to the government or the crowd. 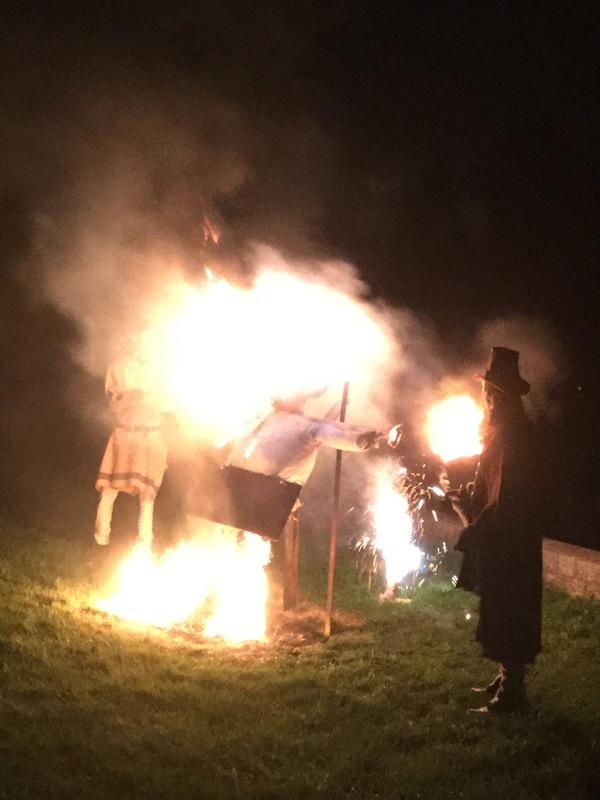 This is why, ever since that night, cities in England burn an effigy of Guy Fawkes every November 5th to warn future traitors to prevent another plot. Also, it should warn the government that they should be weary that this can happen again, and can be completed. They handed out Wassail (“Drink Ale!”) around the bonfire, non-alcoholic of course. It was just apple juice and cranberry juice boiled. I could do with the apple juice but the cranberry was too bitter for me. Can’t stand anything bitter. Luckily I brought my garbage disposal with me; his name is Adam hehe. After the bonfire and Wassail, they played older movies in the makeshift theatre during the week of the tours; our night was the Addams Family. I love any kids Halloween movie so this was perfect. I was, however, bummed that the night before they were playing the original Poltergeist. Sigh, I love that movie but I guess I’ll have to watch it at home. The chairs were fold away chairs but at least had some leather cushions to them. I have enough cushion myself, but this helped. Both Adam and I were nodding our heads being so sleepy, I feel like I’m an adult now, almost falling asleep at movies. The night was a big success though. With the tour being around $14 per person, it was well worth it. You can hardly see a new movie for that, let alone a tour, bonfire, free candy, and a movie! We had so much fun, I think Adam will be dragging me next year!